Did you know, one of our favorite holiday is Moon Festival? This is a holiday about togetherness and it is celebrated through out Asia. 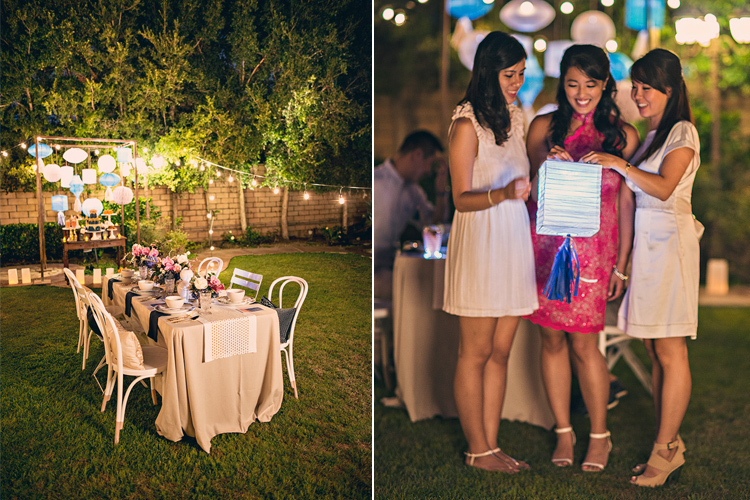 In celebration, we worked with a sweet newly-wed to put together an intimate backyard party inspiration that reflects the couple’s contemporary style as well as their Chinese heritage. The Moon Festival (aka Mid-Autumn Festival, one of the most important day in Chinese culture) originated centuries ago as a holiday to give thanks for the year’s harvest. Today people still celebrate the Moon Festival by reuniting with friends and family under the full harvest moon, said to be the biggest and brightest on this night. Loved ones gather together to view the moon, enjoy each other’s company with lanterns, and share indispensable delicacy – mooncakes. 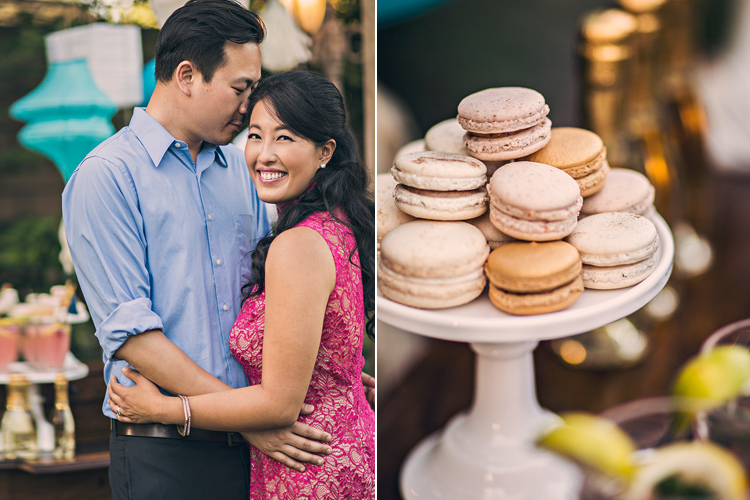 Our featured couple, Joy and Jon, are both creative by profession. 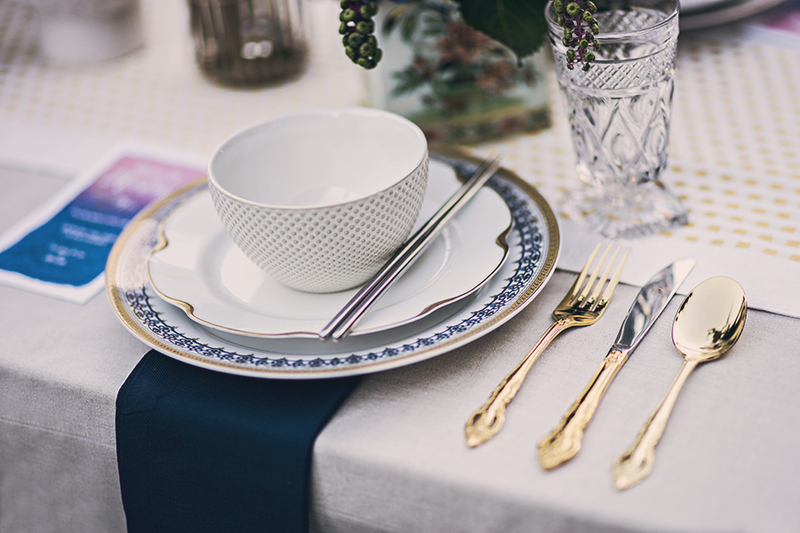 Lovers of style and culinary art, they enjoy hosting dinner parties and entertaining guests. 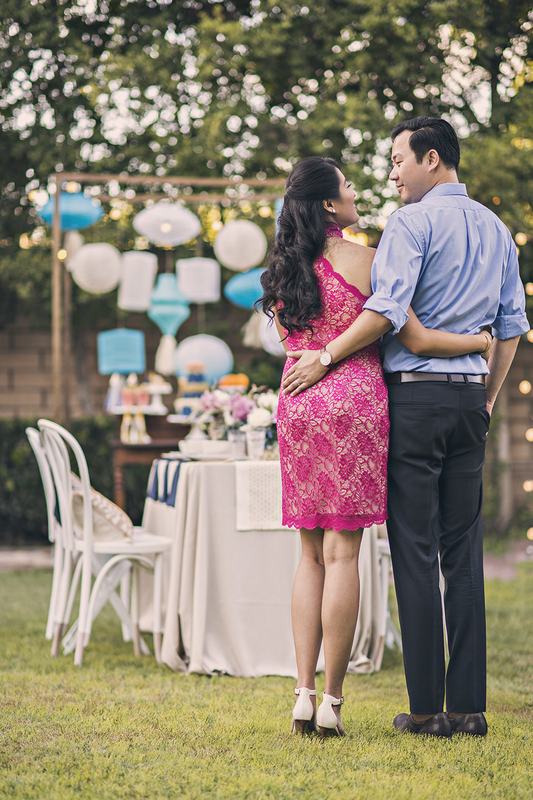 As their first wedding anniversary approaching, they plan on spending a memorable evening with a few good friends. Joy selected our Adalene, a sophisticated single-shoulder sheath dress with mandarin collar, a modern alternative of a traditional Chinese dress for the occasion. 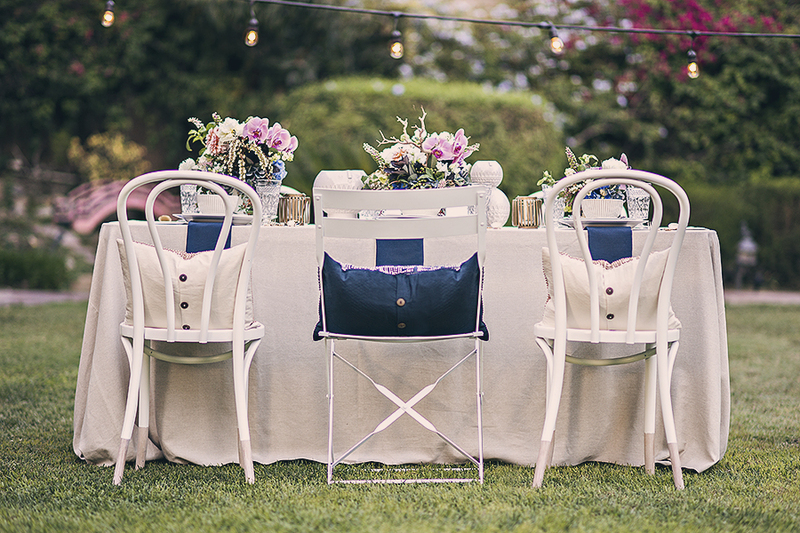 The intimate backyard party is a neat little mix of vintage chic and East meets West touches. 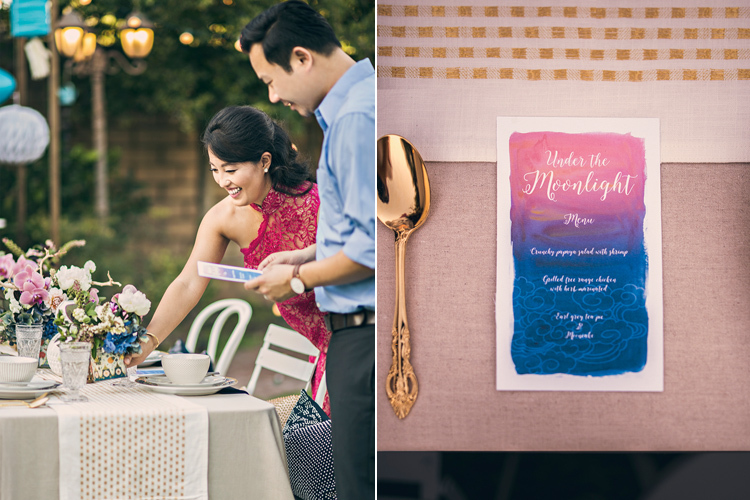 Cultural-infused floral design with popular asian flower such as peony, orchid, & dahlia, pairing with romantic hydrangea and ranuculus, complementing the décor color palette of midnight blue, white, gold, and an accent of coral. 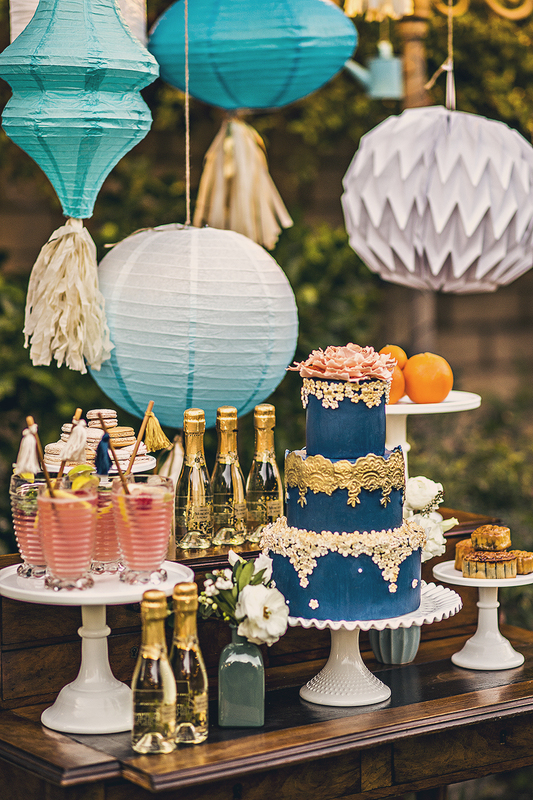 Guests were greeted with fruity cocktail, decorated with DIY stirrers made with bamboo chopsticks and tassels. Surrounded by the soft glow of string lights and lanterns gently swaying in the breeze as the evening creeps its way to darkness. There’s no better way to enjoy an unforgettable gathering with the loved ones under the beautiful moonlight.